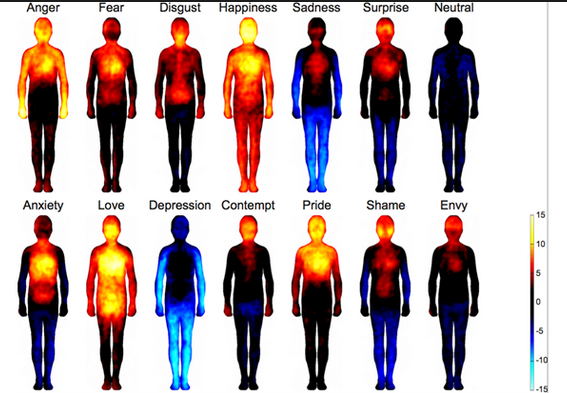 A team of biomedical engineers has mapped the bodily reactions to emotions in 700 individuals and found that patterns were the same, whether the candidate was from Western Europe or East Asia. Likely, you are feeling many different feelings, emotions, and physical sensations. 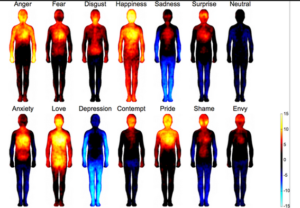 Did you know that how you feel and your emotions can greatly impact your health and well-being? What is happening with your thoughts? Thoughts are connected to emotions, but which came first – the emotion or thought? The mind and body are one. Our thoughts affect our emotions, the body’s functions, and our emotions and feelings affect our mind, thoughts, and outlook. We often think of emotions in terms as good or bad. We tend to avoid or reject unpleasant ones and try to hold on to the positive ones. Some may even reject and judge having emotions as bad and try to live in their heads. We may judge ourselves as weak or inferior due to our feelings. We may feel superior if we tend to have a more positive outlook, but may unknowingly be pushing down feelings at the expense of our health. Learning to acknowledge, release, and be in the flow with our emotions can greatly enhance health, healing, and prevention of illness and disease. We all need a certain amount of tension or ‘positive stress’ to get us out of the bed in the morning and carry out our activities. However, when stress becomes more than we can handle it can negatively impact our health, mental outlook, and emotional well-being. Stress that is left un-checked or dealt with can boil over and in certain cases even lead to death. The immune system becomes compromised and cannot fight off disease, illness, and infection. These may seem like extreme examples, but they are very real. In fact, Dr. Herb Benson states that 60 – 90 % of visits to the doctor are in the mind-body and stress related realms that are often poorly identified and treated. People are often given one more pill treat their symptoms, without the true cause ever being recognized and properly treated. Here are some ways to be healthy with your emotions. Seek professional help if you feel you need it. Some of us suppress or reject our feelings and push them down. Recognize how you feel, and let go of judging the feelings. If you don’t like them, then you can take steps to treat them better and transform them. Whether it be through talking with a friend, making art, writing, making music, singing, dancing, movement or any creative process it can be helpful to express yourself and release what is being held in. Mindfulness is getting a lot of buzz these days and for good reason. Mindfulness is being present with what you are experiencing without judging your experience as good or bad, or right or wrong. When you connect with your higher loving, intuitive self and watch and observe the sensations in your body, thoughts, and emotions as they come and go, rise and fall, you will have, on some level, disconnected from identification with emotions, feelings, and thoughts. This simple process can help cultivate a sense of self-love, self-acceptance, and self-compassion. There is consistent and strong research supporting meditation and relaxation as healthy ways to not only heal, but prevent illness. If it could be bottled and sold it would be in every pharmacy. A regular meditation and relaxation practice can alleviate and transform negative thoughts, beliefs, emotions, stress, anxiety, trauma, physical pain, depression, improve sleep, improve relationships with yourself and others, among many other benefits. Meditation can be a simple process. Find a good teacher and develop the right practice for you. We are energy and everything is including our emotions. Work with your energy to balance your energy systems such as the aura or energy field, the chakras, and energy pathways that circulate through and around your body. Your energy system is a blueprint of your whole being. By improving its functioning you will feel better overall. Work with your energy for yourself or see a trained Energy Healer or Acupuncturist who can help release what may be stuck or not flowing well. Sometimes, we pick up energy from the environment that’s not ours that can create uncomfortable feelings and reactions. By releasing this energy you can feel better in your own energy. Emotional Freedom Technique (EFT) combines energy psychology and acupressure to alleviate physical, mental, emotional, and spiritual symptoms and reach positive goals. Several studies have shown that it can lower stress, physical and emotional pain, anxiety, depression, and post-traumatic stress syndrome, among other benefits. Chinese healers found that applying pressure with their fingers and hands to specific points on the body could relieve pain, alleviate physical symptoms, benefit the function of internal organs, and balance emotions. EFT is a relatively simple technique that to do. While applying acupressure in the form of gentle touch or pressure, tapping on, or imagining touching on 14 major energy pathway points you focus on words, thoughts, and emotional or physical feelings in the body and energy system related to the problem, challenge or the positive feeling you’d like to experience. This opens the energy and can transform painful thoughts and feelings to positive ones. Essential oils are the plant essences that have been distilled into an oil. Essential oils have been used in perfume and healing since time immemorial. They can be applied to skin during massage therapy or worn as perfume for the pleasant scent or to enhance mood or healing. It can be applied to acupoints to assist with energy healing or placed in a diffuser to fill the room with the scent. It can be mixed with salts and placed in bath water or for a foot soak. Essential oils and aromatherapy can lift mood, emotions, depression, anxiety, assist with pain management – an analgesic, can enhance memory, improve relaxation, rest and sleep, can increase energy and vitality, sensory-motor functionng, can prevent illness and several have antibacterial, and antiviral properties. Food can be medicine or food can be toxic, including what you drink or don’t drink or eat. Food is foundational for how your body, mind, and emotions function. Be sure to eat well – we’ve heard it all the time, but what does that mean? Good guidelines to follow are to eat whole foods that have not been processed, that do not include added flavorings or sugar. Eat a balance of fruits, vegetables, proteins, and carbs. Eat organic, non-GMO when possible. Drink plenty of water and limit dehydrating substances such as caffeine and alcohol. Alcohol actually metabolizes like sugar in the body. Be sure to eat regularly to maintain even blood sugar. Eating too much or too little can significantly affect your moods, emotions, thoughts, and how well your body functions. Every body is different. You can tell a lot by how you feel when you eat or drink certain items or skip healthy ones. Listen to your body and treat it well. Learn about what combination of foods work best for you, and consider adding in vitamins or supplements that you may not receive from your diet. Seek support from a nutritional expert if you feel you need it. Remember when you were a kid and you loved to play all day just for the fun of it? What do you love to do? What brings you joy and pleasure just for the sake of engaging in that activity? Whatever is fun and joyful for you can help lift your spirits. Watch a comedy, tell a joke, laugh! Find time to play and have fun! 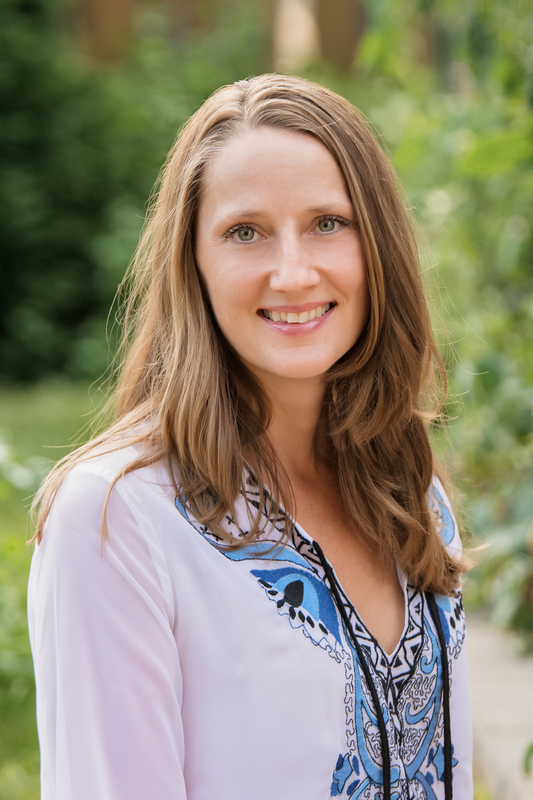 Emmy Vadnais, OTR/L is a Holistic Occupational Therapist who provides Holistic services, classes, and coaching in St. Paul, MN. She can be reached at emmy@emmyvadnais.com. « Happy Valentine’s! How Much Do You Love Yourself?